Anthropologist, writer, and scroll mounter. Neither an artist nor a calligrapher, Liza is the organizer of the MU KORABO. Born in Buenos Aires, Paula is a student living at the San Francisco Zen Center. She lives her Zen Practice as not separate but one with her passion for Japanese arts. 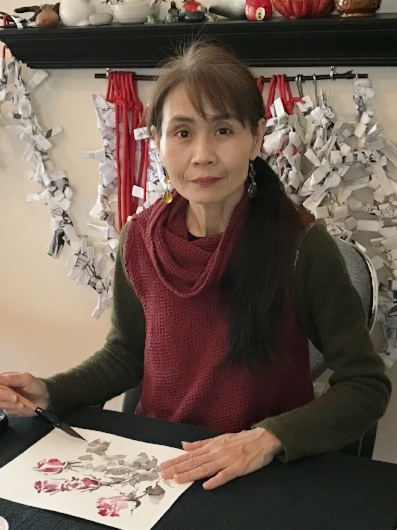 Born and bred in Kyoto, where she studied Japanese art and history, Fumiyo specializes in the Japanese brush painting methods of sumi-e and nihonga. Chloë is an multidisciplinary artist based in Oakland, California. Her work spans both digital and analog media, and and can be seen at www.chloedalby.com and on Instagram @ryethoughts. Peggy lives in San Francisco and has maintained a studio at Hunters Point Shipyard since 1985. 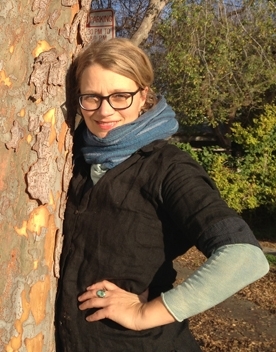 She teaches in the Bayview District in San Francisco and Creative Growth Art Center in Oakland, California. Michael is a Bay Area painter and sculptor living in Sonoma County. He spent many years painting and teaching sumi-e in Kyoto. Born in Kyoto, now living in the California Bay Area, Keiko is an internationally known modern artist and sculptor working in different media. Willis Barnstone is an American poet, memoirist, translator, Hispanist, and comparatist. He is also a New Testament Gnostic scholar. Andrew is an artist based in Minneapolis and Tokyo. His work pulls from film, ukiyo-e, gritty Tokyo streets, and contemporary Japanese and American pop culture. Hidefumi is a professor of mathematics at San Jose State University, with a special interest in plane and three-dimensional geometry, since the latter combines well with another interest of his, woodworking and woodcarving. Bill is an artist living in Point Richmond, CA. He is currently making large ceramic anagama wood fired sculptures and site specific B&W conceptual pieces. American tattoo artist raised in Southern California. Hardy is best known for his Japanese-influenced tattoo work and his apparel and accessories brand Ed Hardy. Although he trained and worked as a painter in the early part of his career, Lubliner’s artwork has been primarily photographic and in recent years has been exhibited in numerous museums and galleries. He is also a member of the Art Squad. 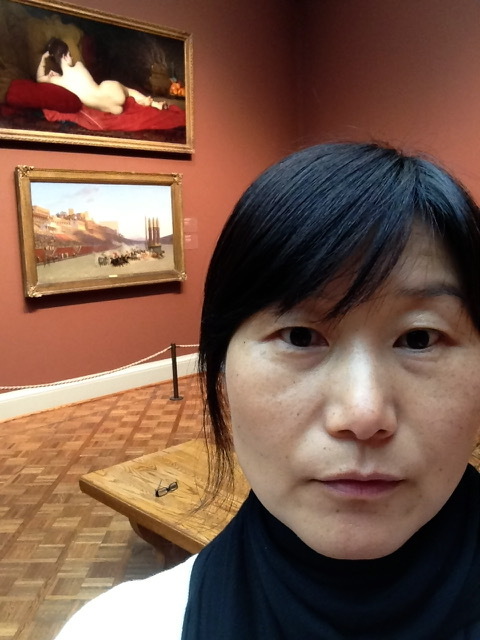 Born in Seoul Korea, educated as an undergraduate at UC Berkeley and received her MFA from SFAI. Based on concept, her art form varies including drawing, painting, digital photography and site-specific installation. Born and educated in Japan, Toru is a master of fine arts in printmaking. Currently he teaches and exhibits in the Bay Area. Damba Tsolmon was born in Darkhan, Mongolia in 1970. He paints his own version of traditional Mongolian painting and calligraphy with techniques that also encompass modern expression. 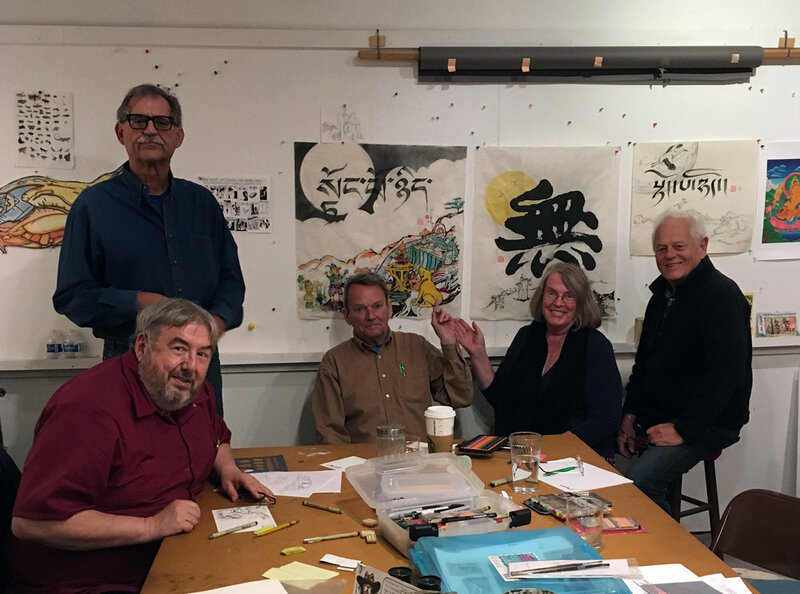 Shown here, Paul Rodgers, John Gaccione, David Moore, Gail Morrison, Robin Lafever. Angelina has explored the resist method of itajime for years, drawn in by the sense of light glowing from within the fabric, as material is transformed by the topography of cloth, bound then revealed. This moment of revealing the inner forms and pattern, a kind of alchemy, an intersection of plant, water, fire, and the human hand.